Throughout Urban Meyer's tenure at Ohio State, running the ball has been the foundation of his teams' success. Long considered a pioneer of the "spread-to-run" offenses that feature multiple wide receivers, yet consistently pick up yards on the ground, it's not surprising that his playbook contains numerous ways to attack defenses in this manner. Having relied heavily on the Tight Zone in his first two years in Columbus, Meyer's teams took advantage of the talent available this fall, spreading the ball around with the use of Jet Sweeps, the Inverted-Veer option, and a number of other concepts that kept defenses guessing. However, one play that hasn't consistently been part of Buckeye game plans during his tenure is the one most people often associate most with spread offenses: the outside zone-read option. Made most famous by Rich Rodriguez's teams at West Virginia, the outside zone-read is a simple play that most football fans can now immediately recognize, and every defensive coordinator knows how to defend. The play uses zone blocking (meaning the linemen are blocking an area, not a specific player) to get the ball to the edge (usually the outside hip of the tackle), but gains a numerical advantage by leaving a defender unblocked with the threat of the quarterback keeping it to run around the opposite end. 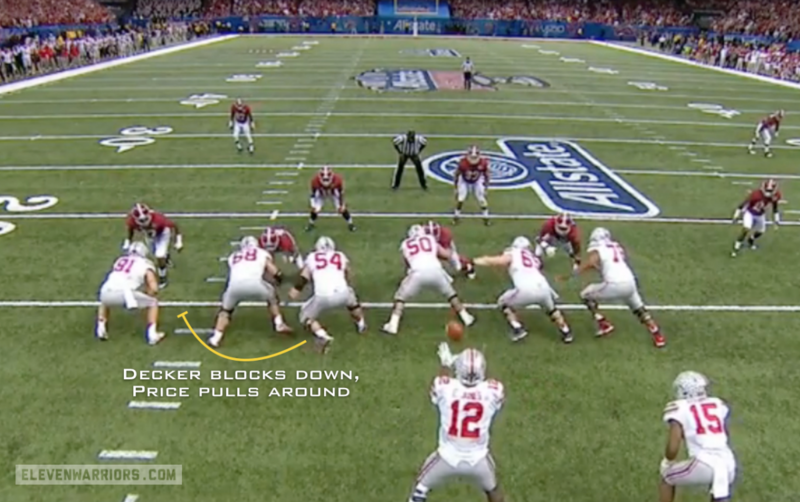 But to find success with the outside zone, the running back must have a special skill set, much different from the powerful, straight ahead approach of Carlos Hyde that was so successful for Meyer and the Buckeyes in the past. The outside zone requires a back with patience, vision, and acceleration, three traits that current Buckeye tailback Ezekiel Elliott has consistently shown over the second half of this season. After clinching the victory over Ohio State's biggest rivals and setting the Big Ten Championship game record for rushing yards with 220 one week later, Elliott became a household name with his performance in the Buckeyes' Sugar Bowl victory over Alabama, tallying 230 yards on the ground. With third-string quarterback Cardale Jones making only his second career start, Meyer leaned heavily on his top running back early in the game, even while facing one of the best rushing defenses in the country. Elliott set the tone for what was to come with a 54-yard run on his second carry of the game, running over All-American safety and Alabama's leading tackler, Landon Collins, in the process. However he didn't do it alone, running behind an offensive line that consistently created holes for scarlet and gray runners, who picked up 281 rushing yards as a team. Though they had put 34 points on the scoreboard, the Buckeyes had begun to sputter on offense in the second half, consistently finding themselves backed up to their own goal line thanks to Alabama Punter JK Scott. With a six-point lead and the ball at their own 15-yard line, Elliott would be called upon once again as the clock ticked under four minutes to play in the SuperDome, but this time with a unique play call. Knowing the Tide would align as they had all night with a nose guard over the center and defensive ends over both tackles in the "Bear" look that Virginia Tech used to stuff the Tight Zone in the Buckeyes' only loss of the season, Meyer looked to take advantage by running the ball to the outside, but with a bit of a twist. Typically on the outside zone, the entire offensive line will take a lateral step at the snap, gaining width instead of depth, and looking to get their bodies in between the defender and the sideline. With Alabama defensive end DJ Pettway (#57) lined up just to the inside of Taylor Decker (#68) though, it wouldn't have made sense for left guard Billy Price (#54) to try and block Pettway, as would normally be the case. 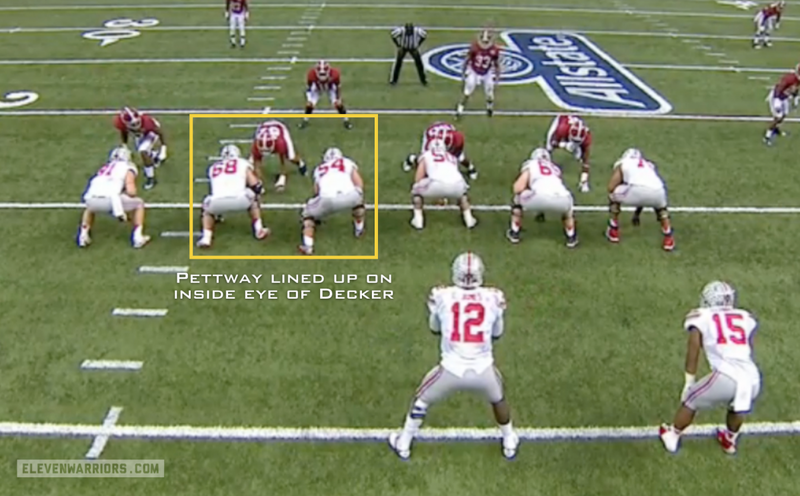 Instead, the Buckeyes called for the "Pin and Pull" technique, where Decker simply drives Pettway toward the inside, using the natural leverage gained from his alignment. Price instead pulls around Decker, and looks for the first man to come in to the gap to his left. The Buckeyes are concerned only with defenders to the left, leaving nickelback Geno Smith (#24) unblocked. Had Smith followed Elliott across the formation, Jones would've had a very easy run around the right end with no defenders within 10 yards. But with Smith heading straight for the backfield, Jones makes the correct read and gives to Elliott, who has his eyes on Price and a potential hole. At this point, we begin to see Elliott exhibiting the traits that make "one-cut" backs like Arian Foster and Jamaal Charles so successful at the next level. Instead of attacking the hole immediately, Elliott runs parallel to the line of scrimmage after taking the handoff, waiting for Price, Decker, and tight end Nick Vannett (#81) to engage with their defenders. As Decker and center Jacoby Boren (#50) seal off the inside, Price and Vannett have sealed the outside, creating a perfect hole through which Elliott can run...with one exception. Alabama linebacker Shaun Dion Hamilton (#11) appears to be sitting directly in the gap, left completely unblocked. Unlike the battle-tested group around him, the freshman was seeing his first serious playing time after replacing injured starter Reggie Ragland, who was knocked out of the game earlier in the quarter. That may have been why the youngster had no clue that OSU wide receiver Evan Spencer was making a beeline straight for him on a crack back block. Spencer made unselfish plays like this all night, and may have been the team's MVP after throwing a perfect touchdown pass, laying a huge (and clean) block on Collins that injured the star's shoulder, rendering him ineffective for the rest of the night, and recovering an onside kick near the end of the game. But the block on Hamilton may have been his most important play of the night. Knowing Spencer was on his way to lay that critical block, Elliott showed the final trait that will make pro scouts take notice, the ability to plant his outside foot in the ground, turn upfield quickly, and immediately dart through the hole. Though Price would get a chip on safety Nick Perry (#27), no one was catching Elliott on this play. The Buckeyes were nine point underdogs and expected to no only be out-coached by Alabama, but also struggle with the physicality up front and the speed on the back end of the Tide defense. Instead, it was Meyer's team that made the right call, catching their opponents off guard before laying some punishing blocks, and out-running them to the end zone. Meyer wasn't afraid to go deep in the playbook at perhaps the most critical juncture of the season, knowing he had the personnel to execute. Though the Buckeyes will have their hands full on both sides of the ball with Oregon, it's hard to discount the effect that Elliott and the slobs up front will have on that matchup.